Historic flooding events have dominated the news this week as heavy rain and snowmelt pummel the Midwest. While we may feel powerless during flooding events, we have the power, with help from CWPPRA, to restore our wetlands that protect us from this surplus of water. Because wetlands act as sponges, they store floodwaters that can otherwise damage our communities. 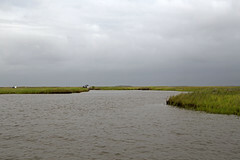 Flooding events played a key role in forming the wetlands of coastal Louisiana. During times of high water, the Mississippi River would flood, resupplying our wetlands with much needed sediment and freshwater. As sediment collected along the banks, the river would change course to travel to the Gulf of Mexico along the path of least resistance. By building our communities on the banks of the Mississippi and installing levees along the river to protect us from these natural flooding events, we have starved our wetlands. In addition to starving our wetlands, we have hardened and paved our communities. Concrete and asphalt parking lots, driveways, and sidewalks cannot absorb excess rainwater like wetlands can, increasing the likelihood of flooding events and greatly impacting our communities. Flood regimes are determined by a set of characteristic flooding conditions in a watershed including climatic and geologic influences as well as human modification. In Louisiana, the Mississippi River’s flood regime responds to snowmelt and heavy rains upriver as well as any rain in the lower basin. Periods of high water in the southern half of the river usually occur during spring and early summer. The three largest floods the river has seen in the last 100 years (1927, 1993, and 2011) occurred in April and May. Hydrology, the study of water flow, is crucial to planning for flood events. Through extensive study, the flood regime of the Mississippi River and many of its tributaries (and its primary distributary, the Atchafalaya River) are understood well enough to predict where flooding will occur after heavy rain throughout the watershed. The Army Corps of Engineers manages floodgates and spillways by diverting excess water to flood control areas to keep property damage to a minimum. Consequently, those flood control areas can accrete sediment and build land. Natural events, like flooding, turn into natural disasters as we further impact the natural processes within our ecosystems. Wetlands are vital natural flood protection strategies in Louisiana as well as throughout the world. CWPPRA works to restore coastal wetlands to protect communities from inundation. Downtown Baton Rouge roared to life on Saturday, April 6, and Sunday, April 7, with the Ebb and Flow Festival. 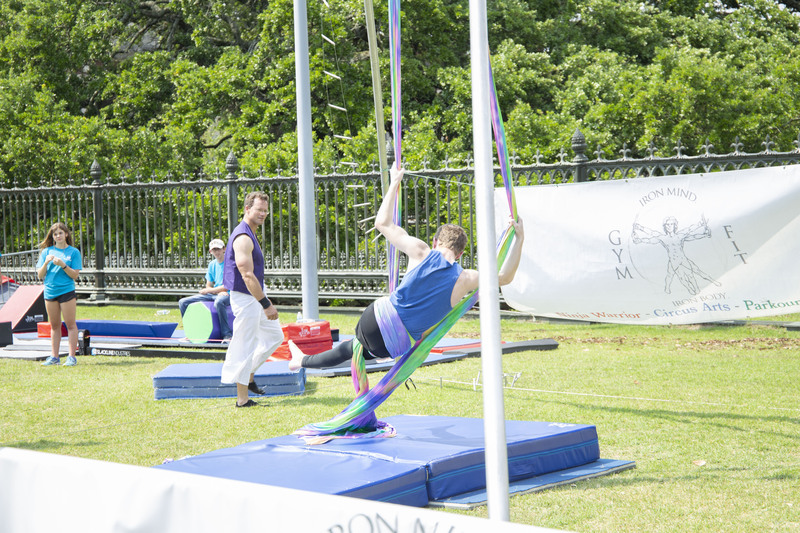 Hosted by the Arts Council of Greater Baton Rouge, artistic expression and creative ingenuity were showcased throughout the Capitol City’s Downtown. During the festival, it was evident that Louisiana’s coastal wetlands don’t just protect us from storms but also enhance our everyday lives by influencing our art and culture. 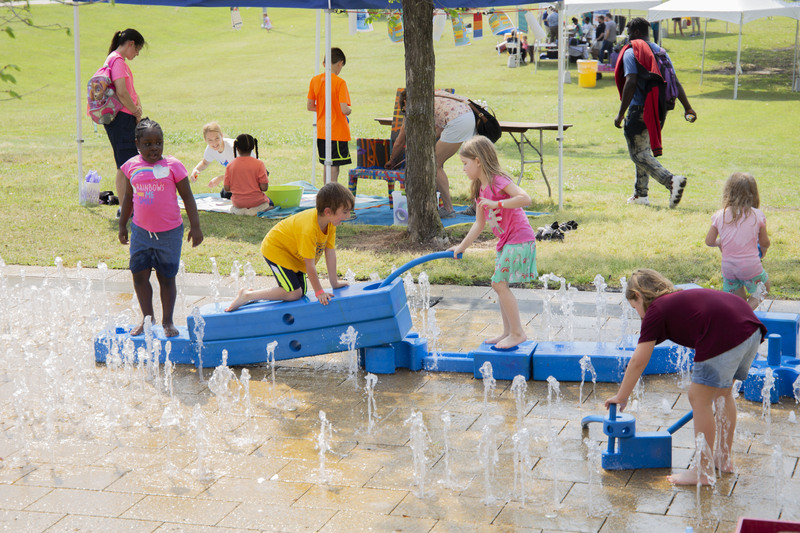 Photographers, painters, and various artists shared the beauty of our coastal wetlands through their renderings of coastal landscapes, photographs of wading birds, and sculptures carved from cypress, all which were highlighted along the banks of the Mississippi River. CWPPRA’s Outreach team had a steady flow of families throughout the day with our Wetland Jeopardy game and our new series of vintage project posters. Visitors asked us about the restoration techniques we implement and threats to our coastal zone. We were set up near the IDEA stage where young entrepreneurs practiced their pitches for competitions to secure funding for business startups. 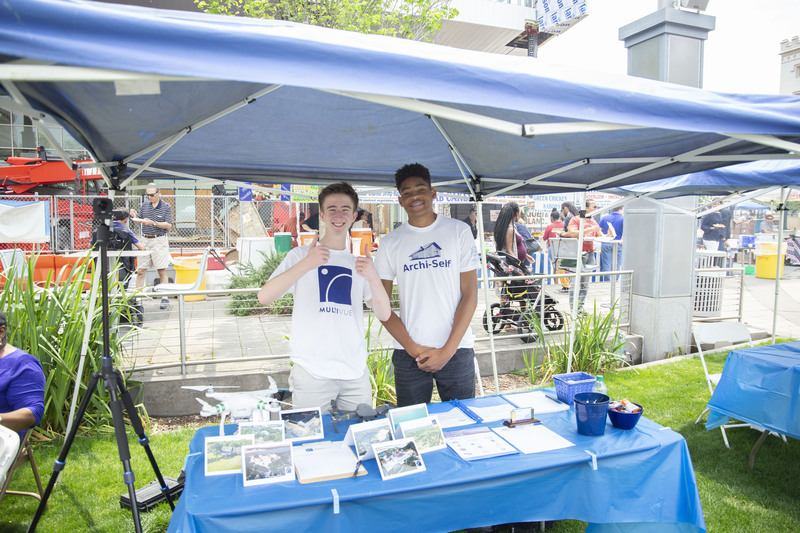 These high school students pitched a diverse range of fresh ideas for new businesses. 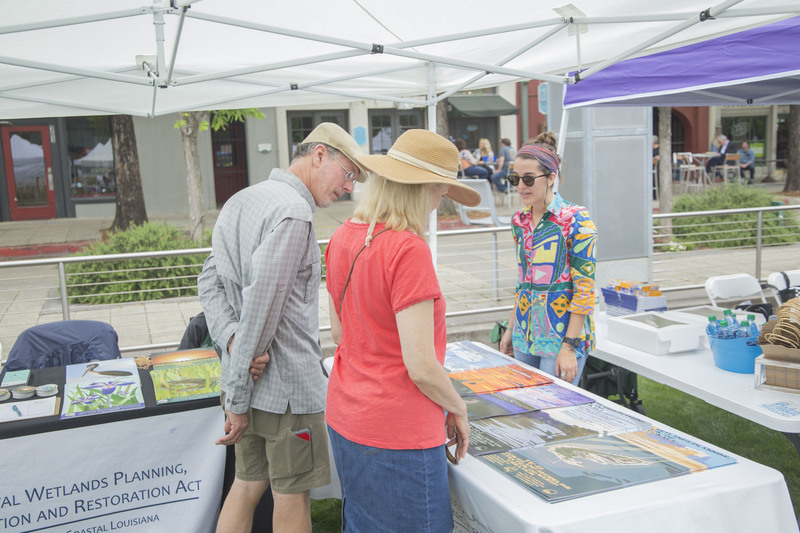 In addition to CWPPRA, organizations talked to visitors about topics from baking and nutrition to bike trails, youth involvement in the arts to raising show animals, and many others. 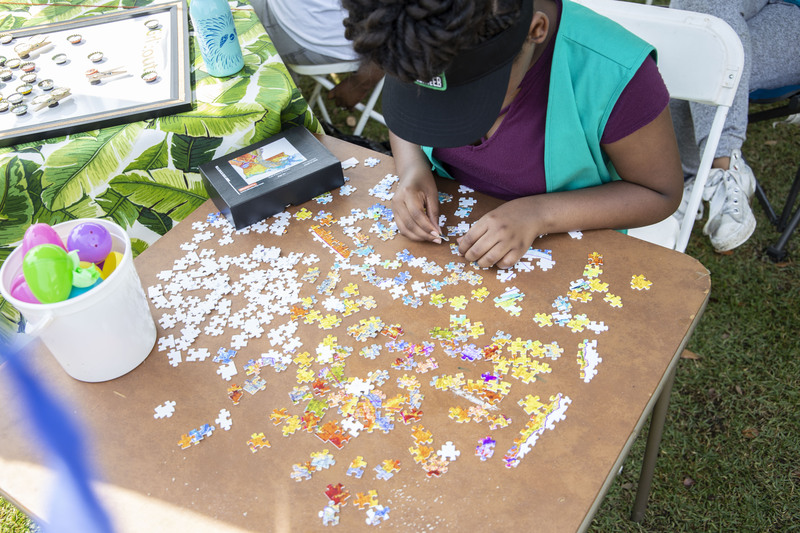 Visitors could hunt for Easter eggs that contained puzzle pieces from the local Girl Scouts who were putting together a map of Louisiana and teaching about land loss. Musicians filled the Northern side of the festival. Hugging the river’s edge, the Louisiana Art and Science Museum was open for business. Two young Entrepreneurs, good luck! Visitors to our booth are checking out our new posters! In a conference call with our Outreach Committee last week, a committee member reminded us to discuss the human component in our Habitat Toss outreach activity. We’re taking it a step further and turning our focus to various ethnic and cultural groups who settled the Louisiana wetlands and support themselves and their families through coastal industries. Today, our focus is on the Isleños of Louisiana. During the late eighteenth century, these people originally immigrated to the United States from the Canary Islands, off the west coast of Africa. According to the official website, Los Isleños of St. Bernard Parish, Spain sent settlers from the Canary Islands to settle around New Orleans from 1778 to 1783 in response to British interest in Mexico. Since the Spanish had a large investment already in Mexico, they sent Canarians to establish settlements to counter British expansion towards Mexico, but instead, the new colonists formed communities that built strong ties to existing industry in the area. Four settlements were created by the Spanish for Canarians and other immigrants to live in and develop: Galveztown, Valenzuela, Barataria, and San Bernardo. For the first few years of each settlement, Spain subsidized costs and gave many of these new Canarian colonists (Isleños) land grants. Subsidies stopped in 1785 when the colonies became self-sustaining. San Bernardo became a successful agricultural community, thanks to the fertile soils of the lower Mississippi River Watershed. Under French Rule, the community was later renamed to St. Bernard. In only seven short years, the Isleños established strong communities which later became major players in sugar, cattle, and several other farm crops. Some Isleños chose to leave their farms and joined the commercial fishing industry in the 1820s, ultimately becoming the Delacroix Island fishing community. Later in the century, the communities of Yscloskey and Shell Beach were founded through the same method. Today, those communities are still heavily involved in the commercial fishing industry, but their homes are threatened by coastal land loss. CWPPRA has funded the design and implementation of several projects in that area. Though the history of St. Bernard Parish has been preserved for generations, it would be a tremendous loss to have such a historic area wash away due to preventable causes. It is for this reason that CWPPRA works to #ProtectOurCoast. Find out more about the Islenos and their coastal legacy through the Los Isleños Heritage and Cultural Society website: http://www.losislenos.org/. Last Friday, March 22, we spent the morning at Green T. Lindon Elementary School’s Math and Science Day. The Youngsville school hosted a variety of presenters throughout the school day, including KRVS 88.7FM, LASOAR, Lafayette’s Nature Station, a retired tennis instructor, and various UL Lafayette faculty members. Throughout the day, classes moved between stations around the school and explored multiple topics in math and science disciplines. Some of the available stations taught students about yoga, CrossFit, radio technology, bats, proper hand-washing protocol, tennis, and outdoor family recreation. Our Public Outreach office brought three of our most popular games and split classes into groups and rotated through the three activities to learn about wetland types, inhabitants of wetlands, and wetland services. Wetland Jeopardy, led by intern Blair Miller, was played as a competition among students, Coastal Outreach Specialist Kacie Wright introduced students to a few wetland inhabitants through our Wetland Wonders boxes, and Outreach Coordinator Jennifer Guidry led our bean bag toss game that highlights the differences between three wetland habitats and the open ocean. Students rotated through the activities every 10 minutes before going to their next activity in another classroom or outside. 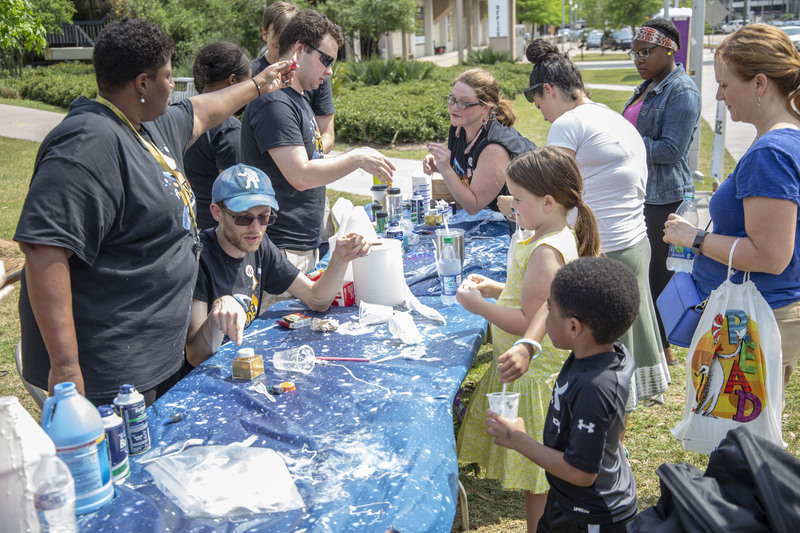 One young student participated in Family Adventure Day the prior weekend and was able to lead the habitat toss game for his group, which was a great demonstration of our outreach activities’ impact. We saw a total of 132 third graders in just two hours! We gave out stickers, magnets, and activity books. It was a fast-paced day full of excitement and we look forward to participating again next year. Buckle up sports fans, because things are heating up, and not just on the college basketball court. CWPPRA projects are putting their best foot forward to land a spot in the next round of competition. There are 22 contending players going into a free-for-all to win a spot on CWPPRA’s roster. This draft means a lot to the strength of our team, so it is important that all the potential projects are in peak condition. The CWPPRA project selection process is all about fundamentals. Projects are evaluated on how strong they would be on the defense for the United States national team and ranked accordingly. Task Force “coaches” are looking for projects that can block opponents such as hurricanes, will continue to develop after they join the team, and will work well with with other projects. Today, our contenders are practicing and refining their fundamentals before they have a shoot-out on April 11th on the technical committee’s home court in Baton Rouge. Technical Committee members will select a subset of 10 player projects that they think will be well-rounded to benefit team Louisiana and all its fans. That list of 10 projects will go on to the final round of the competition, and up to 4 will make the cut. If you are a fan of coastal restoration, feel free to send us your draft picks for the upcoming vote! All the current stats for the candidate list can be found on our March 11 newsflash at https://www.lacoast.gov/ocmc/MailContent.aspx?ID=10119. We look forward to signing some of these exciting new prospects and we wish the projects luck!